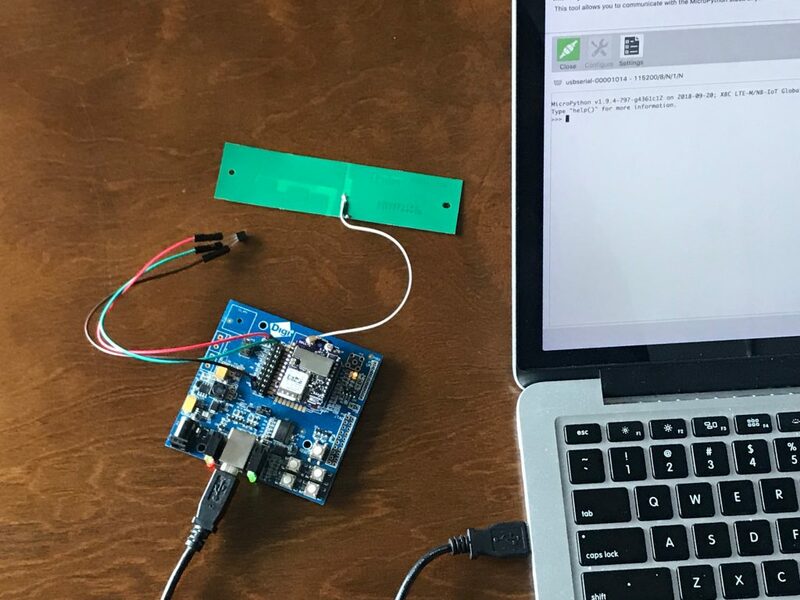 In our first post in the MicroPython programming for the edge series, we talked about how to collect sensor readings and make sense of them using the Digi XBee3 Cellular LTE-M Kit, as well as Digi’s free configuration software, XCTU, and some simple MicroPython code. Welcome to Part 2 of this series. The edge intelligence provided in Digi’s XBee3 line of embedded RF modules makes sending data to the cloud a snap. 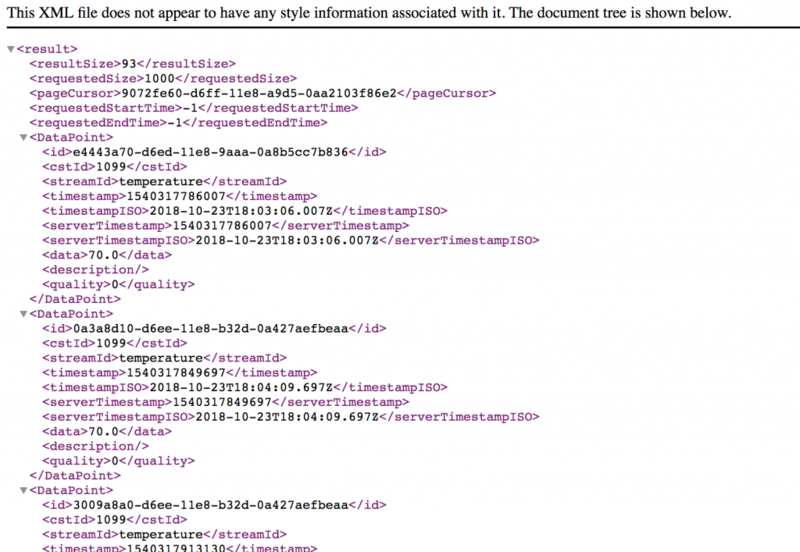 For our second project in this hands-on series, we show how to upload temperature readings measured from a Digi XBee3 Cellular LTE-M module to “data streams” on Digi Remote Manager (DRM). Developers can use this data and device management platform for free. The Digi XBee3 Cellular line supports open communications standards, so it can also share data with Amazon’s IoT Platform, Microsoft Azure, Adafruit.io, Google Cloud IoT, ThingSpeak, IBM Watson and many others. Look for hands-on tutorials or several of those in future projects. Readers of our first project will recall that MicroPython is an open-source programming language based on Python 3, modified to fit on small devices and optimized for microcontrollers. By using MicroPython you can rapidly create connections to cloud services right from the edges of your network. Many IoT systems feed data to online cloud platforms on the Internet. They typically sample some value locally, like temperature, then send the readings to any one of a dizzying number of online application for logging, processing and data visualization. In this project, we will take some temperature measurements using a simple sensor, then send them to Digi Remote Manager® as a “data stream” that can be visualized in different ways, accessed via an open API or stored for later use. We begin with the exact same hardware setup used in the “Sense, Transform and Send a Value” project, including the TMP36 temperature sensor. 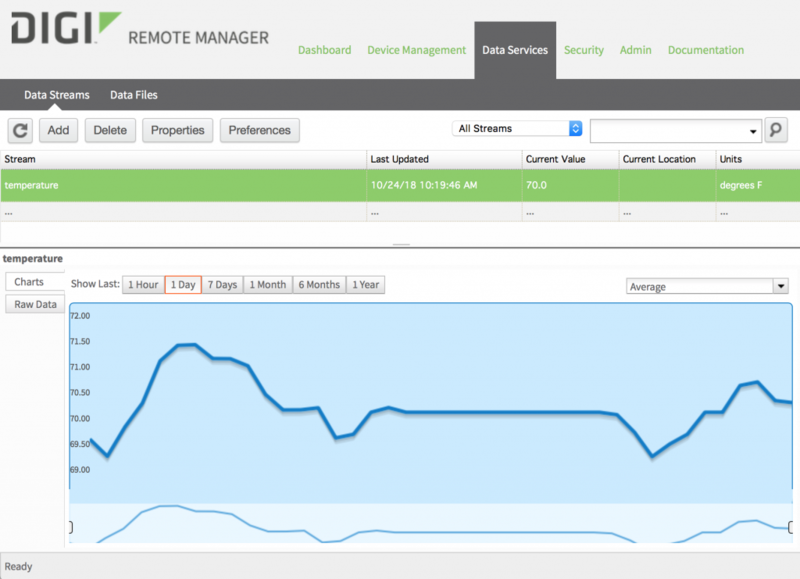 Remote Manager enables you to configure and manage dynamic device networks. A free developer account lets you explore Remote Manager’s application development and device management tools, with a limited number of devices and transactions, for as long as you need to. Follow the steps for creating your account. If you need help setting up or using your account, see the Remote Manager User Guide. Your Remote Manager account username and password will let your Digi XBee3 Cellular upload data streams, in this case temperature measurements. It provides a layer of security that’s appropriate to this simple example. Many additional layers of security and authentication are available to provide increased protection for production applications, though we won’t look at those right now so we can focus on the basics. To make our code simpler and more readable, we rely on two libraries uploaded to the file system inside the Digi XBee3 Cellular module. These libraries are collections of pre-written code. They provide simple ways to call complex routines without the routines themselves cluttering up your program. 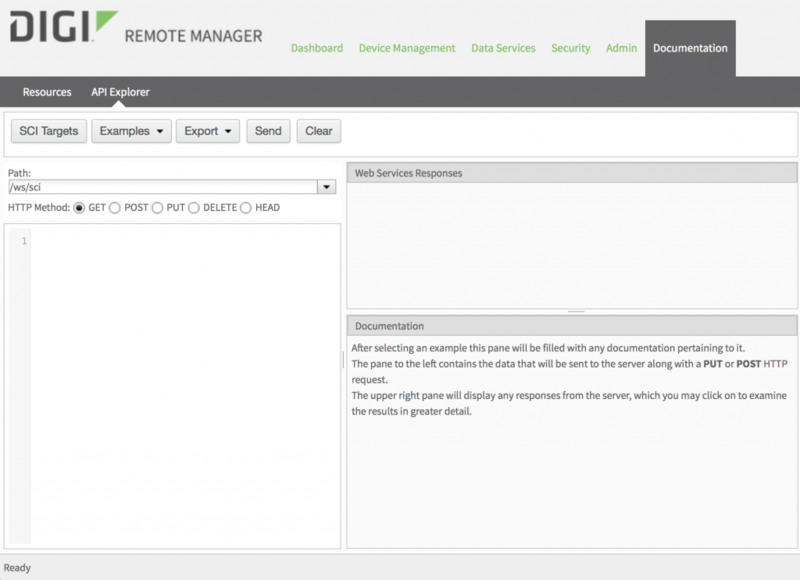 For this example we will use the remotemanager library, and the urequests library that remotemanager requires. Locate the remotemanager.py and urequests.py libraries on this GitHub page: https://github.com/digidotcom/xbee-micropython/tree/master/lib. Right-click on each filename and select Download to create a local copy of each on your computer. (GitHub users could also Clone or Download the entire repository here: https://github.com/digidotcom/xbee-micropython). With your Digi XBee3 and XBIB board added to XCTU, open the Tools menu and select File System Manager. Click Open to connect the File System Manager to your Digi XBee3’s file system. Navigate the “Local Path” folders in the left-hand column to find the remotemanager.py and urequests.py files you just downloaded. Use the “Remote Path” folders in the right-hand column to open the “lib” directory (“/flash/lib”). Drag the remotemanager.py and urequests.py files from your local directory and drop them in the remote “lib” directory to store them on the XBee3. When you are done, close the File System Manager window. Currently the MicroPython program pasted at the Ctrl-F prompt in the REPL is the only way to run a program at startup. Once this pasted program is executing, it can import modules from the file system as well as writing files out to it. Launching from a filesystem file is on Digi’s development roadmap so look for this feature in future firmware. The module is configured identically to our first Sense, Transform and Send a Value project. If anything might have changed, mount the Digi XBee3 Cellular on the XBIB board and connected to your computer over USB, launch the XCTU program. Add a radio module, then click on that device in the list to configure it. BD Baud Rate should be set to 115200  and AP API Enable set to MicroPython REPL . Write these settings to the module, using the pencil icon at the top. Copy the below code to a text editor like Notepad. Be sure to enter your own username and password, replacing “your_username_here” and “your_password_here” before uploading the code. By default, this program sends a temperature reading to Digi Remote Manager data stream once per minute, over 24 hours (1440 samples). You can customize that by changing the wait_time or cycles variables as desired. 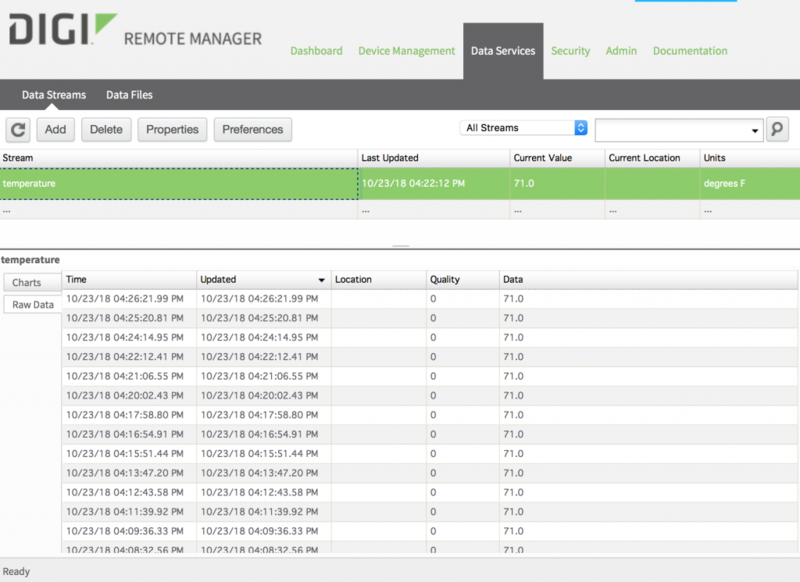 Log in to Digi Remote Manager and select the Data Services tab. Click on the Stream named “temperature” to select it. Locate the Charts and Raw Data area below. It may be helpful to drag the separator line upwards to enlarge this area. Click on Charts to see line graphs of the temperature data. Daily, weekly, monthly and yearly summary graphs can be generated. Related white paper: 5 Reasons You Should Consider Embedded Cellular Connectivity. This Digi Remote Manager example demonstrates one way to centralize your IoT system’s data uploads. You can now create multiple sensors that all transfer data to a central location online. You created your first DRM account, located your data and visualized it. We also covered uploading libraries to Digi XBee3 Cellular using the File System Manager in XCTU. The File System Manager can also manage key files and security certificates that are required by many online IoT platforms. In future posts, we will look at uploading data to other cloud applications, triggering alerts, improving battery life, reducing bandwidth costs and much more. Your feedback about this series is welcome. Please post any questions or suggestions in the comments below.